The fate of Windows 8 being eagerly adopted among small to mid-sized businesses or ignored like it was named Vista may lie in the hands of employees who ask for the operating system or not, according to a new user survey coming out of the U.S.
Windows 8 is being tested at most U.S. SMBs, but actual adoption has actually slowed slightly since the launch of Microsoft’s most radical redesign of its flagship product since Windows 95, according to a market insights report released in February by Spiceworks Inc. The survey was conducted of more than 1,000 respondents entirely in the U.S. at two times – ahead of the Windows 8 launch in August 2012 and following it in December 2012. Though it didn’t contain any Canadian respondents, it provides a strong hint at how the Windows 8 discussion is going at SMBs north of the border. Many SMBs are at least testing Windows 8, with 69 per cent saying they’re doing so with a test environment, on a few limited PCs in production, or in a virtual environment. That’s up from 48 per cent saying they were testing (with a release preview) prior to the product’s commercial launch. 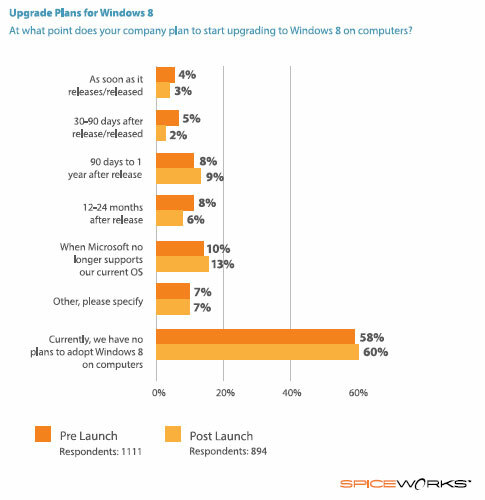 But slightly less SMBs actually plan to adopt Windows 8 following the release. Just one-fifth of SMBs plan to adopt the new OS within two years versus the pre-launch survey that indicated one-quarter of SMBs planned to do the same. While it’s not exactly the bottom falling out on adoption plans, the fact more SMBs aren’t planning to adopt soon after launch is bad news for Microsoft. One of the main factors behind the lethargy could be that few businesses actually see much difference between Windows 8 and Windows 7 (which 96 per cent are currently supporting). Thirty-six per cent of SMBs say they see “no major improvements” in Windows 8 over Windows 7. When asked why they are not planning to adopt Windows 8 sooner, 57 per cent said it offered “no real advantages over current OS used,” the most popular response. The good news for Microsoft is those who planned to adopt it within 90 days of release did see improvements in speed (64 per cent), security (58 per cent), and manageability (44 per cent), among other qualities. Also, IT departments appear willing to move to the OS if their employees demand it. If workers bring a Windows 8 tablet to work and ask to use it, 71 per cent of IT professionals will acquiesce and support it. So it may be that Windows 8’s consumer success will dictate its success in the business market as well, unless Microsoft can communicate the business case for migrating to the new OS more convincingly.